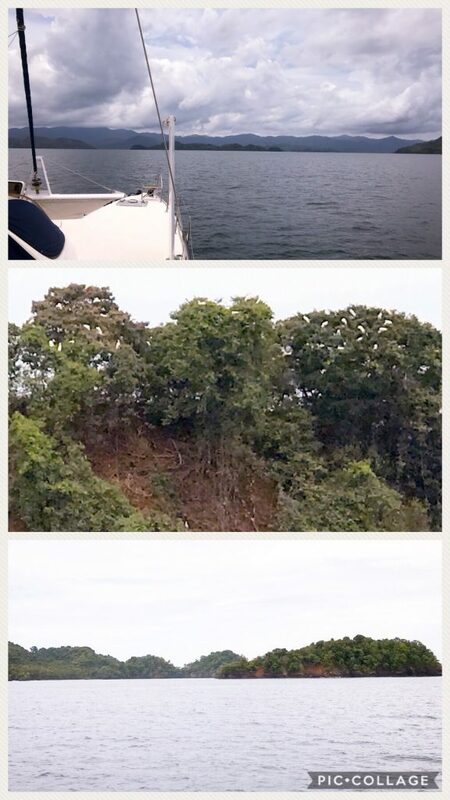 As we made our way to the Islas Secas, we went through a narrow cut between some reefs and islands. Up on the top of one of the hills in this cut, hidden behind a canopy of trees was a house overlooking the bay. This journey took us 5.5 hours to motor sail 33 miles from Bahia Honda to the Islas Secas, which means “Dry Islands.” This chain is made up of 3 small islands: Isla Pargo, Isla Cavada, and Isla Coco. The largest island, Isla Cavada is privately owned with an airstrip and an expensive eco-resort called Islas Secas Beach Resort. Evidently, you can rent a luxury tent for $600 per night with all amenities. We tried to snoop, but when we went ashore, we were told they had VIPs on property and we would need to come back in 2 days. Since we saw the helicopter land earlier, we figured it wasn’t a fib, plus they were really, really nice. 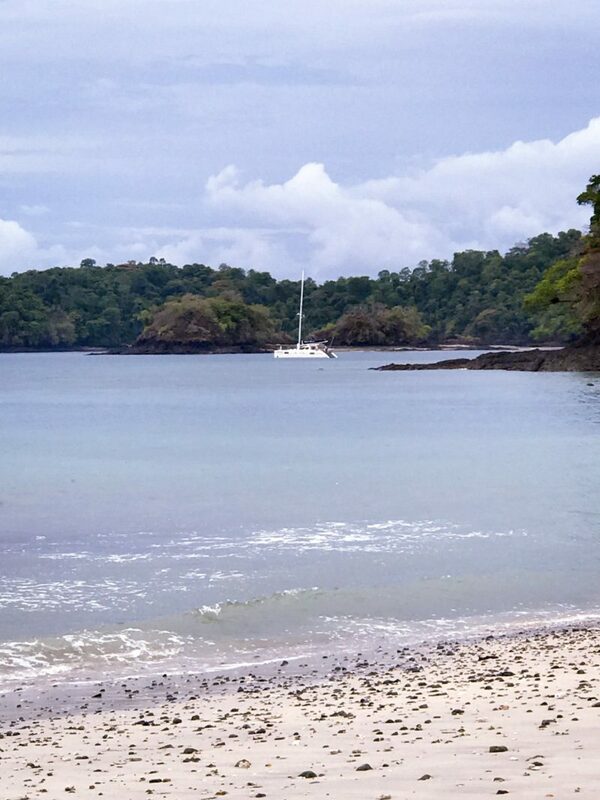 Isla Pargo, the island to the South of Isla Cavada has one anchorage, a white sandy beach, small stream, and a trail that leads you from one side of the island to the other during low tide. 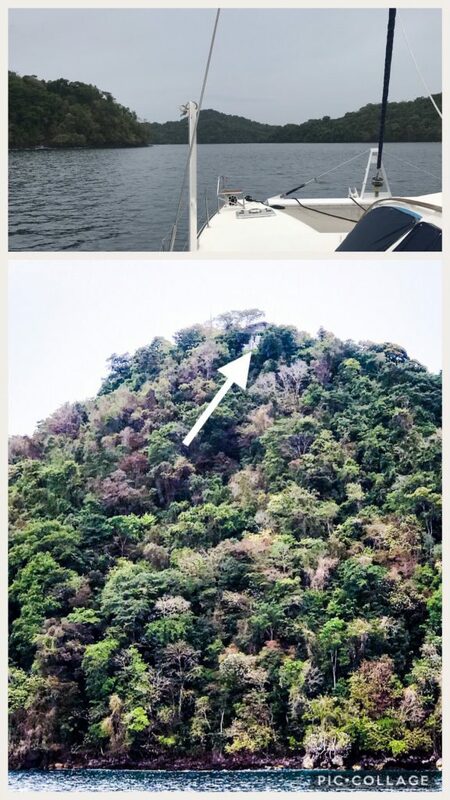 Isla Coco is the smallest island with a poor anchorage. 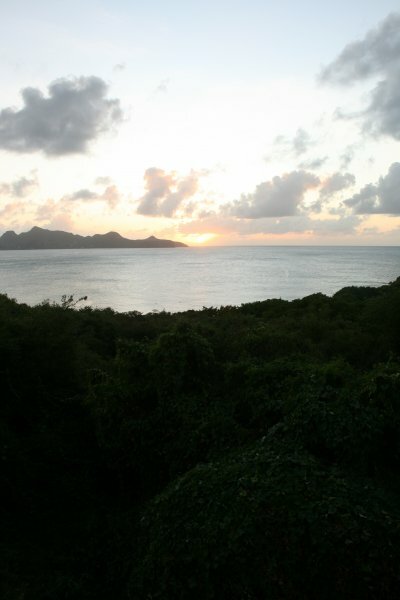 However, it is known for its amazing diving and snorkeling. 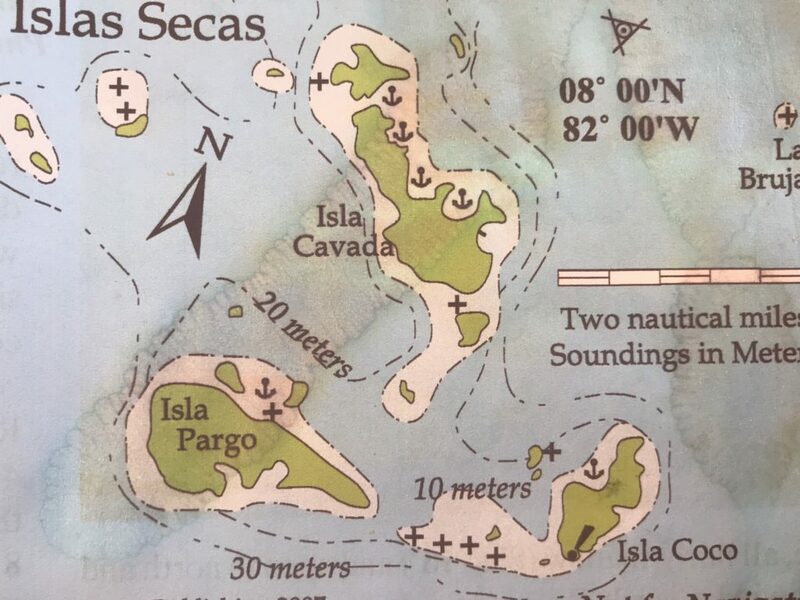 We anchored near Isla Cavada (which means Concave Island). When we arrived a Navy boat and a small monohulls were already here. 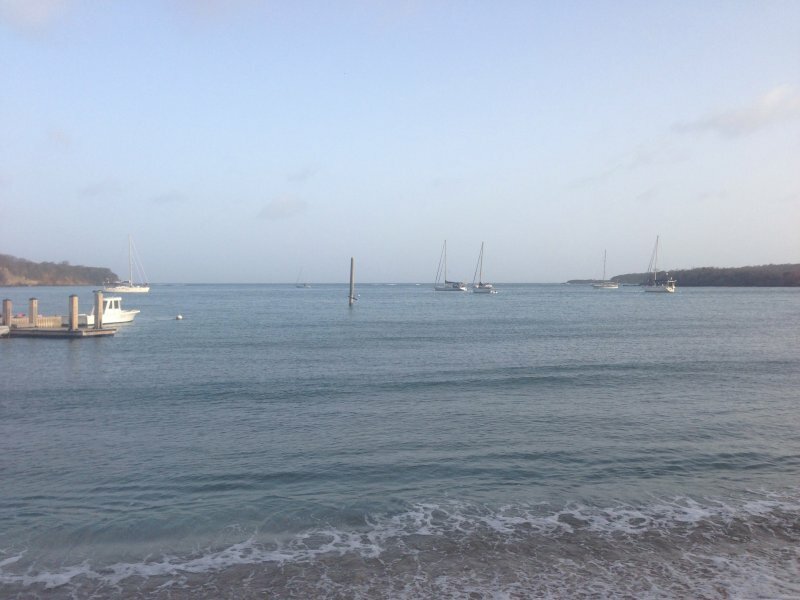 By dinner time, the Navy boat left, the storm rolled in, and another catamaran anchored on the opposite end of the bay. 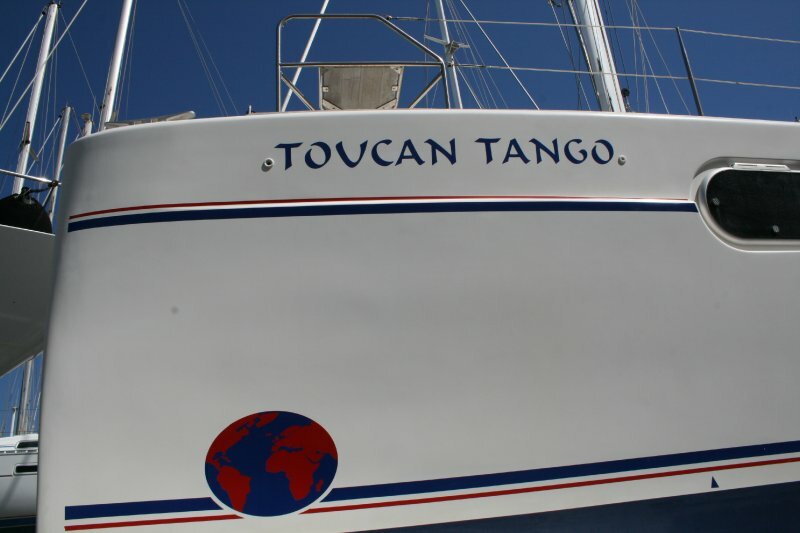 It was a peaceful anchorage, but we set three alarms due to the precarious anchorage. 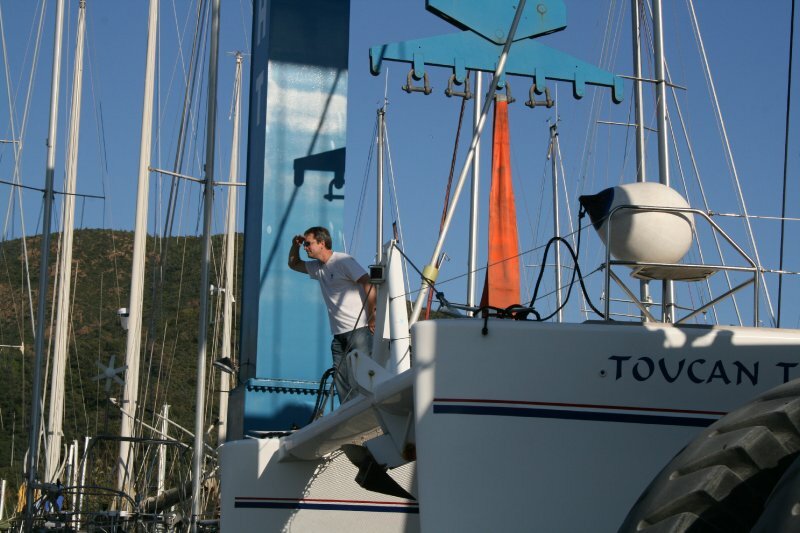 When we set the anchor, we were in 10 meters of water. 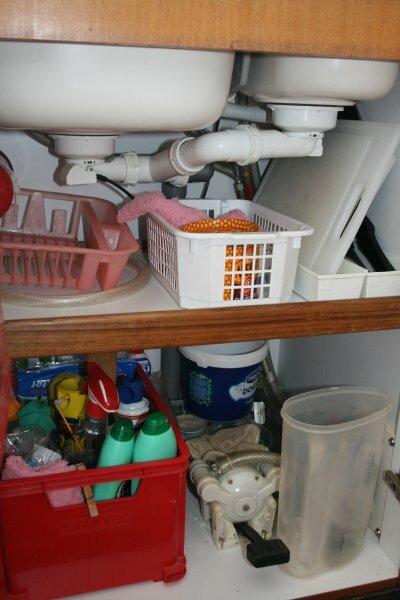 However, with the storm and wind shift, the boat shifted over 3 meters of water. We can easily float in 1 meter of water, but with the tide changes, we don’t want to be anywhere near a 1-meter spot. So, we set a depth alarm, wind alarm, and proximity alarm. Several alarms went off during the night which meant a disturbed sleep. The next morning, we got up and took the SUPs to one of the beaches on Isla Cavada. It was a pretty beach tucked into the side of the hill that is submerged under water during high tide. Image below: Top view of beach coming in on SUPs, and view of Sugar Shack from beach. 2nd Row view of beach and blossoming rock. 3rd Row Amazing air plants growing in a tree and view of beach on opposing side. Bottom row one of the many hermit crabs playing with my toes and Matt resting on his SUP on the way back to the boat. After resting a bit on the boat, we hopped in the water to explore the underworld surroundings of the Islas Secas. It had been awhile since we were able to swim and we did not want to miss this opportunity. We could tell that there are a lot of coral heads in this bay, but we did not know what else lies beneath the boat. There was a very abundant coral life growing strong and healthy, but not too many fish. We did spy (2) puffers that were black with radiant blue spots, a bright yellow puffer, and several pretty large trigger fish. It’s hard to be impressed when you’ve been diving in Bonaire, but this was pretty and unique. 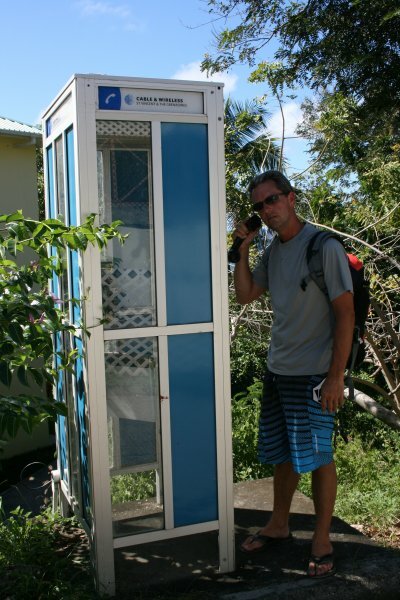 The next day, we decided to hit the road early to get to our next destination, Isla Parida. A short 22-mile journey took us just over 3 hours. We had planned on anchoring at Punta Jurel, but when we arrived it did not look anything like the guide book. 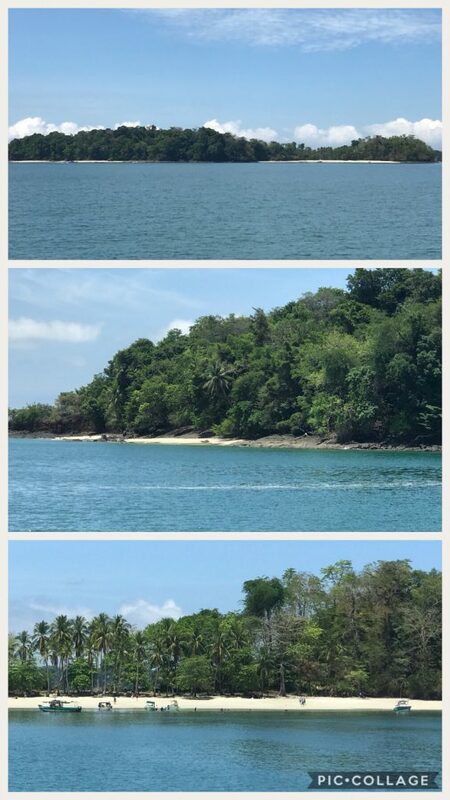 So, we moseyed on over to a neighboring island called Isla Gamez that showcased two beautiful beaches. 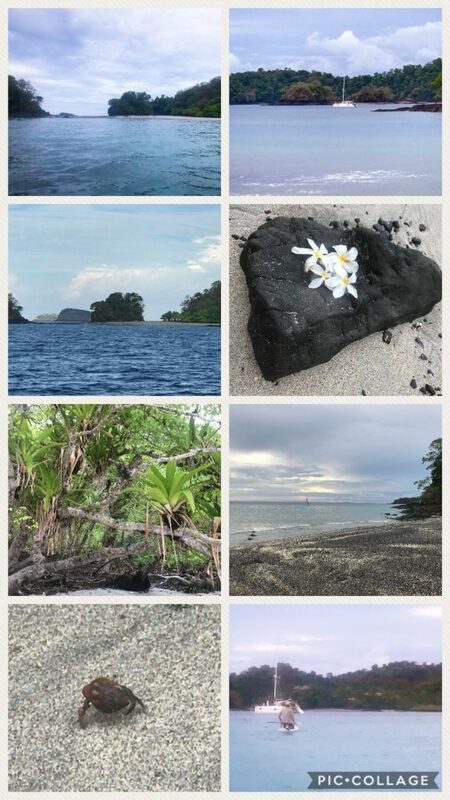 And, there are 4 more beaches on surrounding islands that are easily accessible. We arrived before lunch, dropped the hook and admired the Sunday Funday going on with 8-10 tourist and local boats. After lunch, we decided to take the SUPs over to the island to join the fun. It was a lovely little beach, pretty water, and good music. We did not stay long as each group seemed to be doing their own thing, but everyone was lovely. Later in the afternoon, we took Sweetie out to explore some of the other beaches on Islas Secas. We found one hidden beach with lots of palm trees in a little bay that would be delightful to stay for a week or more. 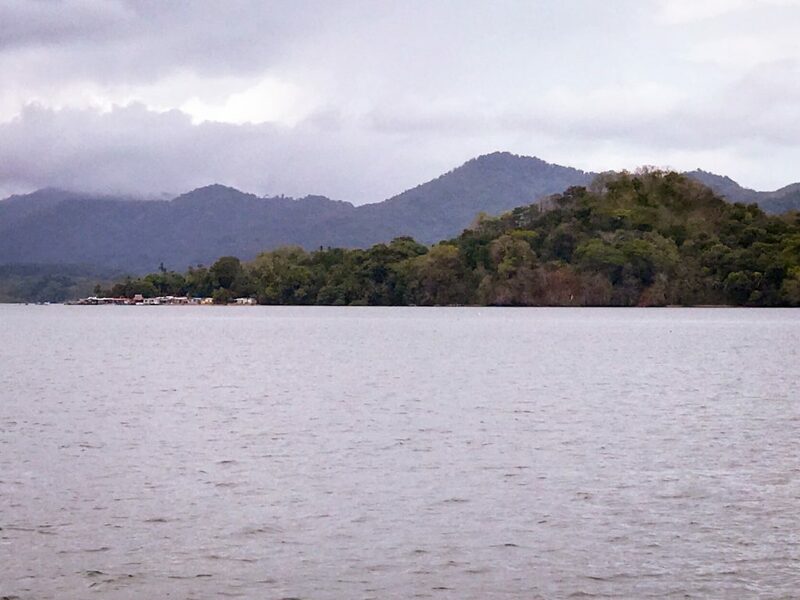 Unfortunately, we needed to get going, so we packed the boat up and headed for Golfito. 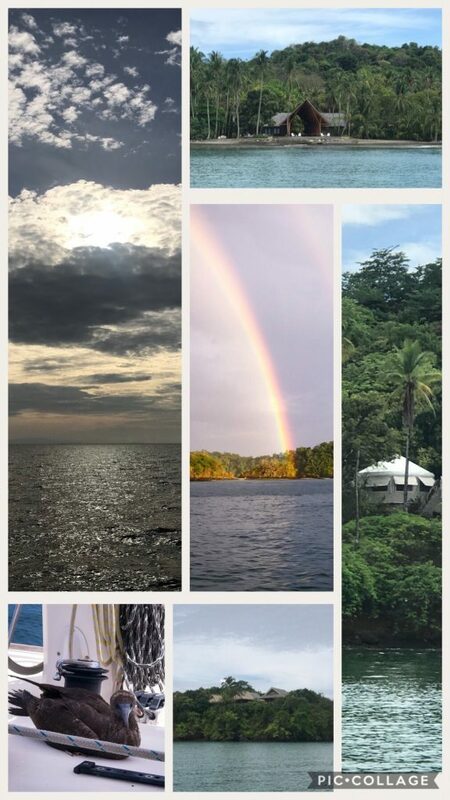 This entry was posted in Panama Pacific and tagged bahia honda, Isla Cavada, Isla Coco, Isla Gamez, Isla Pargo, Isla Parida, Isla Secas, Islas Secas Beach Resort, passage, Punta Jurel, sailing a catana, sailing on a cata, sugar shack on June 12, 2018 by Christine. 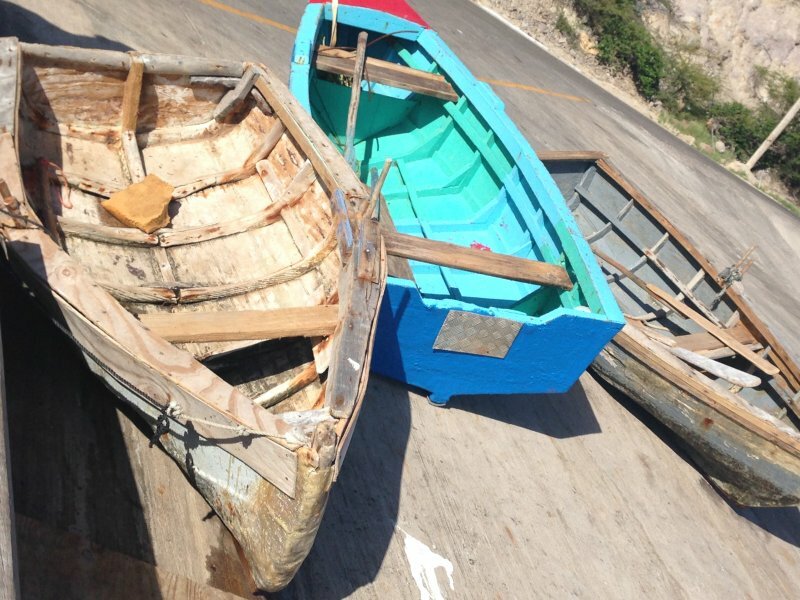 We visit two islands: Isla Santa Catalina and Bahia Honda. First, a short 13 nm away, is a small island called Isla Santa Catalina. 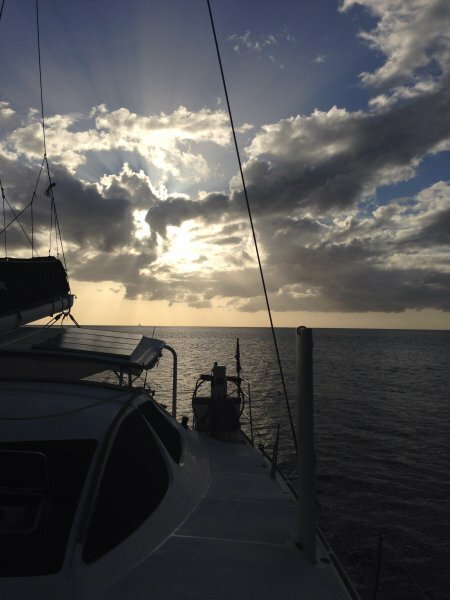 We pulled up anchor at Isla Cebaco in sweltering heat, with no wind, scattered clouds, and a bright blue sky. It was good weather conditions to fly the jib with 12-13 knots of wind at 60 degrees. All of our charts showed many reefs and shallow spots along the way. And midway between us and our destination was a 4-meter shallow spot that we were trying to avoid. Strange to be so far off shore in only 7-17 meters of water. The depth vacillated a lot and quickly. 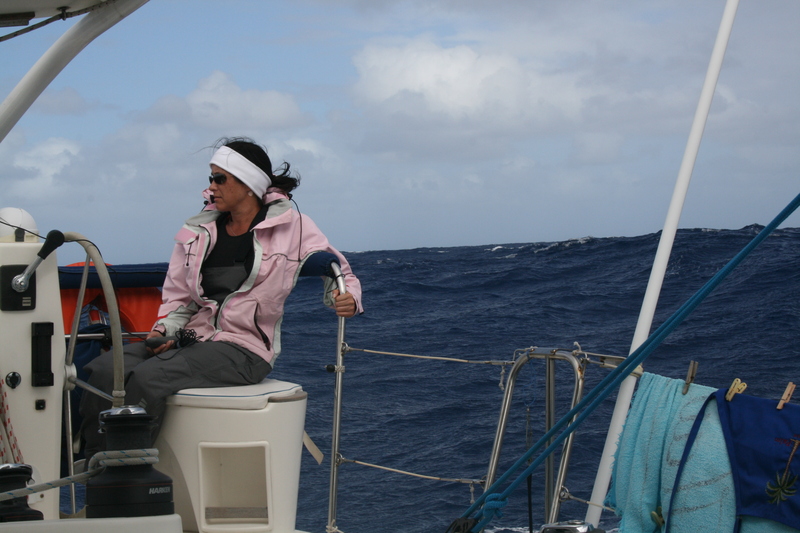 As we were motor sailing along, we noticed a huge squall off to port. It appeared to be heading away from us, but as we continued along, it kept getting bigger and bigger. Lots of thunder. Dark foreboding clouds, and big swells. We hustled to put the eyebrow and rain shades down before the worst of it hit, but to no avail. The rain was coming down in sheets making it challenging to see. In fact, it was coming down so hard that we lost sight of the island that was a ½ mile in front of us. Luckily, we have 5 charts, all of which combined are decent to navigate by so we were able to drop the hook and retreat inside. Even though rainy season is not technically supposed to start for 5 more days, we’re thinking it’s here. We remained inside for the rest of the night as the sky unloaded buckets of water. It was a peaceful night until about 0200 when it became really rolly. High tide came in and brought with it some big waves that kept us awake for a few hours. 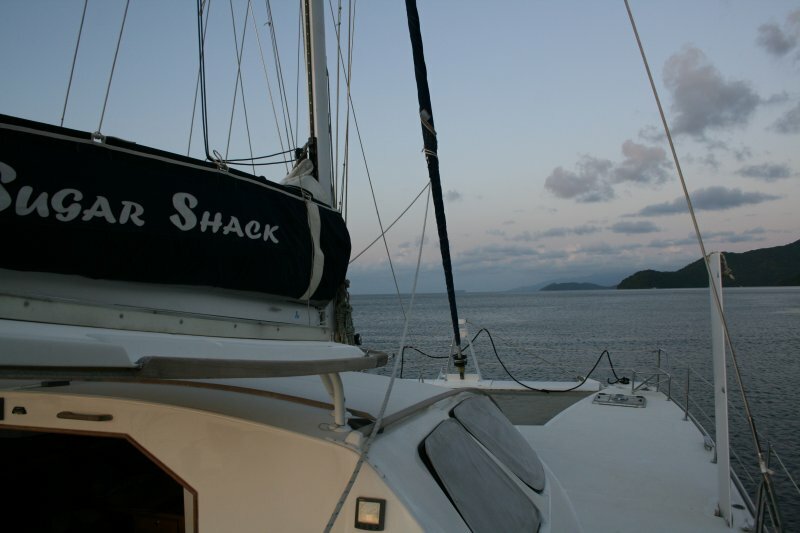 But by early dawn, it calmed down and became the sweet, innocent anchorage we fell asleep in the night before. 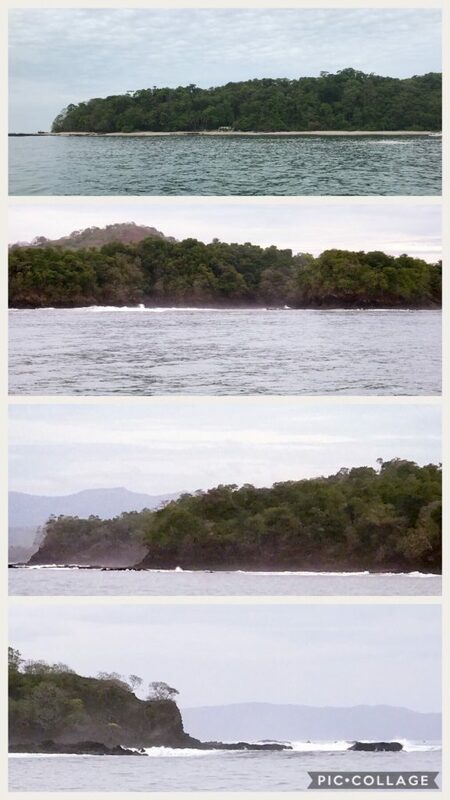 Image: Top: is Isla Catalina with a dilapidated surf shack and lower three photos are neighboring islands with some serious surf and breakwater. The next morning, we set our schedule as we periodically have to live by a timeline. 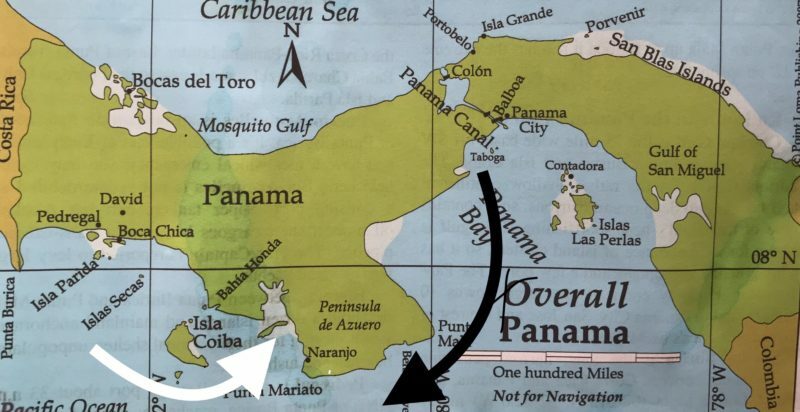 We are trying to make our way to Gulfito without missing the many islands that lay between Panama and the Costa Rica border. Monica, Matt’s mom, is coming to visit us in northern Costa Rica in a few weeks. 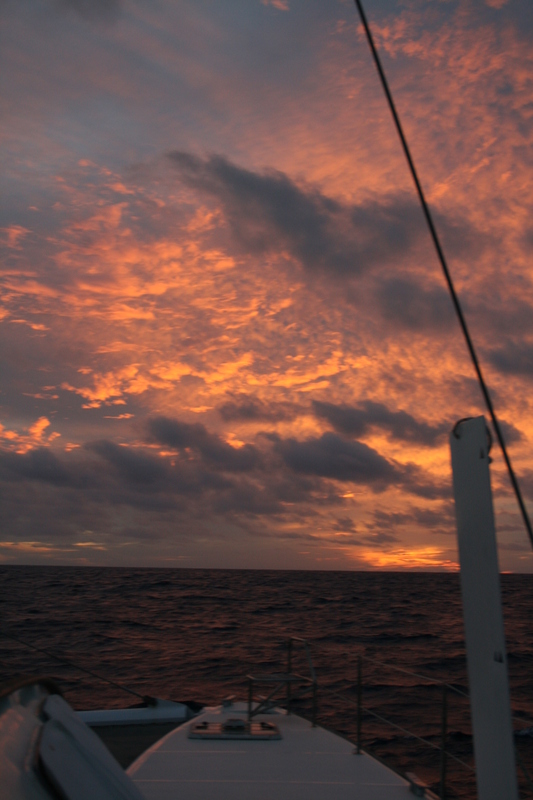 It is a little over 300nm from Isla Santa Catalina to Herradura Bay where we are meeting her. Technically, we could make that passage in 2-3 days, but we would miss dozens of lovely anchorages, beaches, and islands. 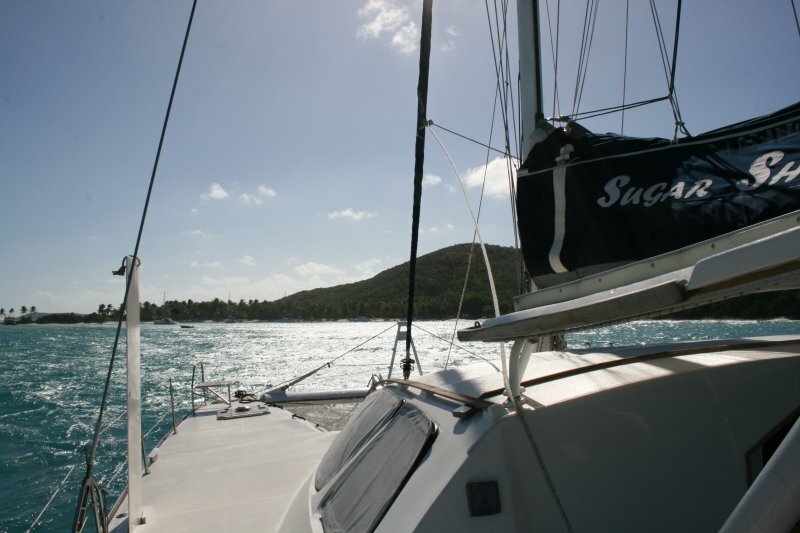 After we created a “soft” sail plan, we got Sugar Shack ready to head to Bahia Honda. A short 21-mile motor in really calm conditions, no wind, lots of birds and fish, and a few dolphins. These dolphins always look like they are scratching their backs on the bottom of our bows. They seem so close. But, Matt said that our red bottom paint would come off on their silky skin (it’s ablative paint which means it is meant to come off easily but prevent growth). Since the dolphins had no red tattoos, I assumed they are just barely missing our boat. As we entered the mouth of Bahia Honda, we were surprised by the tall, green, mountains that make up this beautiful and spacious bay. Image below: Top entering Bahia Honda (overcast day); Middle little island with trees speckled in white birds; Bottom surrounding islands. As we were anchoring, a panga approached with an older gentleman and two kids. They politely stayed back until we set the anchor. Only then, did they approach our boat. His name was Domingo and the kids were his grandchildren. He wanted to welcome us to the bay, showed us where he lived, and told us that he has not seen many boats lately. 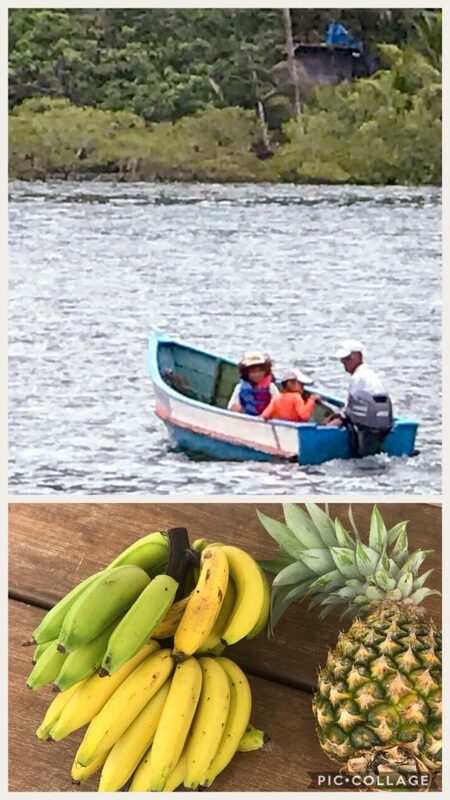 He gave us a bunch of sweet finger bananas and a pineapple and asked for nothing in return. Of course, I scrounged around for school supplies for the kids and Matt gave him a few small fishing hooks. Around 1500 another squall came through. 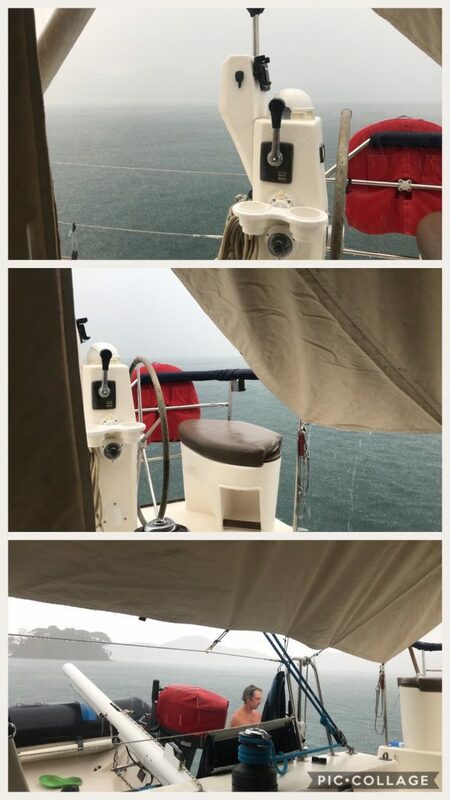 At least we were already anchored and prepared, so Matt took advantage of the fresh water and washed off the deck and took a shower. I love this shot of two of my new favorite bananas. 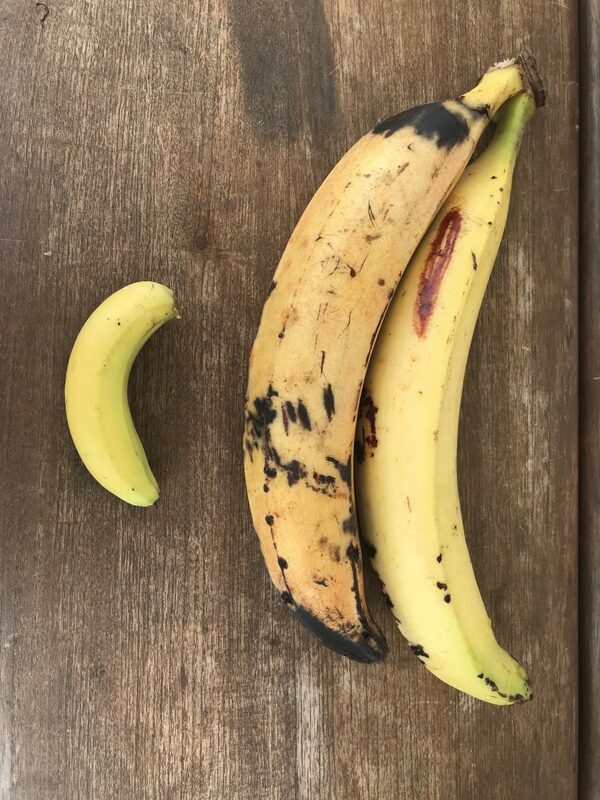 The small one is a fingerling banana which is really sweet and the two large ones are plantains. Matt has become an expert at frying them in oil to perfection for a sweet treat after dinner. Later in the afternoon, Kennedy stopped by. He is Domingo’s son and the father of the two kids we met the day before. He told us that he works for an American family across the bay and that they are part of the Bush family. Interesting. Kennedy has worked for the family for over 20 years. He was very nice and asked for a few items to trade as he said that everything is very expensive to bring in from Panama City and he’d prefer to trade for fruit. They were looking for children’s clothes, shoes, batteries, cooking oil, milk, and fishing hooks. Across the bay is Isla Bahia Honda where there is a small village, school and tienda (market). The night was really calm and peaceful. This is a very tranquil bay, full of wildlife and sweet people. The next morning, we received another visitor, Santo who is Domingo’s other son. He was interested in trading his word work for batteries, jackets, shoes. At this point we are emptied out, not sure what we will do at the next stop. After a few hours of cleaning, we pulled the hook and headed to our next stop. 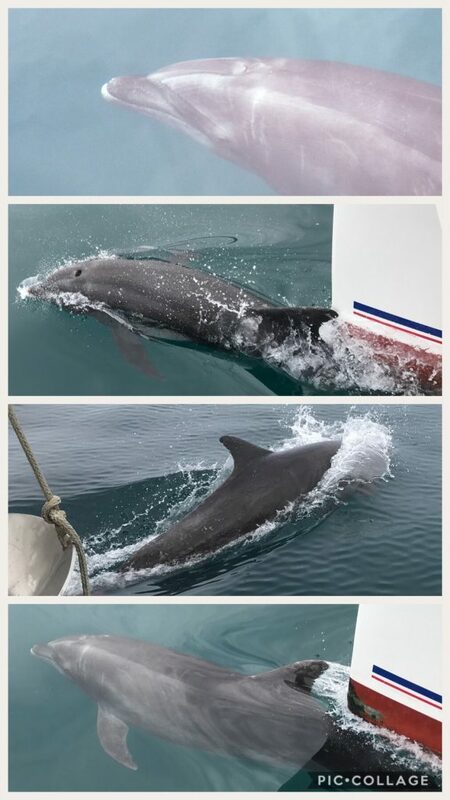 This entry was posted in Panama Pacific and tagged bahia honda, dolphins, Isla Cebaco, panama, sailing on a catamaran, sugar shack on June 7, 2018 by Christine.